After finishing my studies in Brazil, I took a job in Auckland mainly because of the job opportunities and kite spots nearby, after all it’s called the city of sails. There are plenty of activities to do in New-Zealand, especially if you enjoy hiking (tramping), mountain biking, surfing, and occasionally even skiing. However, the winter can be cold and very rainy not to mention the non-existent party scene. So if you plan on going, do so in the summer! Shoal bay at low tide, not recommended. 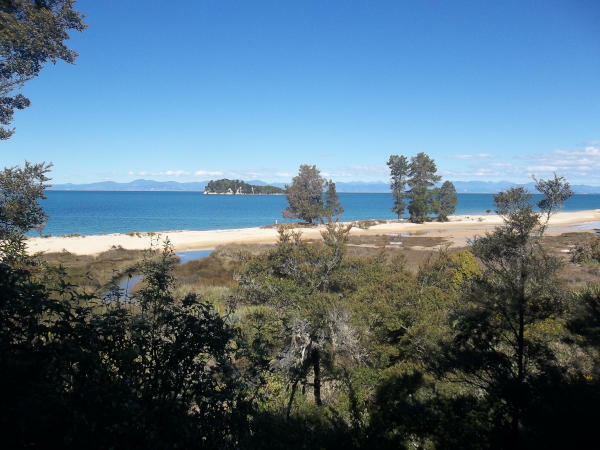 The Abel Tasman National Park close to Nelson is a beautiful park with easy trails. 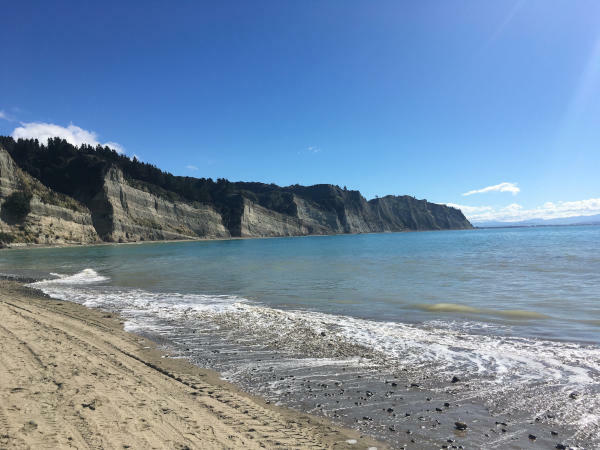 The white cliffs close to Napier. 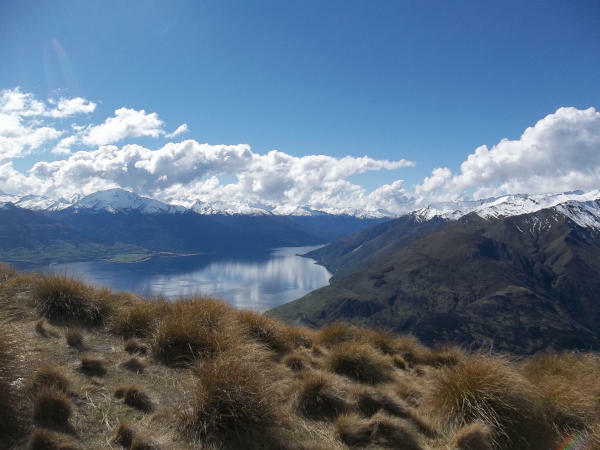 The Isthmus Peak Track near Wanaka delivers. Auckland is located on a small stretch of land between the Tasman and Pacific oceans, with an abundance of bays, beaches, ports and estuaries. The more beautiful parts of the city all lie along the coast, most notably Devonport, Takapuna and Mission Bay with their lively scene of bars and restaurants. The Central Business District (CBD) and surrounding neighbourhoods (Ponsonby, Grey Lynn, Kingsland, Parnell) are best to live in if you want to avoid traffic and be close to jobs. Living further north means traffic jams everyday, especially from Takapuna! The air quality is really good in Auckland due to the sea breezes, but it also gives rapidly changing weather. In general, every day has sunshine and every day has rain. From the city you have many trips you can do. A great day trip from the city is Rangitoto island, the volcano in front of the Auckland bay, or Waiheke to the east which is known for its wine. To the west of Auckland you have the Waitakere ranges with along the coast a beautiful surf spot called Piha. North of Auckland you could go to the Waipu area, the Bay of Islands, ninety mile beach or one of the many forest ranges. Going southward of Auckland is where most Aucklanders go in the weekends (leading to the Friday and Sunday afternoon queues). I strongly recommend Coromandel and the Taupo region for the many things they offer. If you enjoy mountain biking then Rotorua is a must-do! Raglan is a great surf spot and is only a two hour drive from Auckland. Napier and Wellington are worth a visit on the north island, and don’t forget to go skiing on Mount Ruapehu in the winter. The south island can only truly be explored by a roadtrip of several weeks. Don’t miss out on Nelson and its Abel Tasman National Park, Wanaka and Queenstown for their ski season, and Arthur’s Pass for its beautiful hikes. The wind in Auckland (and in New-Zealand in general) comes primarily from the south-west and occasionally from the north-east†. The winter has proven to be fairly windstill for me, but late spring and summer have plenty of wind. It is said that Wellington is the windiest city in New-Zealand, so windwise this might be a better location than Auckland. The wind is very unpredictable and forecasts from Windfinder have been underestimates usually. The best way to check how the wind is at the spot, is by checking the web cams around Auckland. See Auckland Web Cams for a list of web cams. Each has a windspeed graph embedded to check the current windspeed. Also see Surf2surf Muriwai. There are a couple of well-known spots right in the city but I’ve found them to be quite mediocre. Although Shoal Bay can be nice on a westerly, you need to be careful with the shells and the spot disappears with low tide. Point Chevalier is supposedly nice too, but I think there are better spots for westerlies! Muriwai Beach - This is an advanced spot with high waves and very strong wind. It is an hour drive from the city and usually has the strongest winds. Only possible with westerlies. Shakespeare Bay - One of my favorite spots an hour north of Auckland. It is great on south-westerlies and has a beautiful view of the skyline of Auckland. It has a nice grass area to land the kite and there are almost no shells in the beach. There are even barbaque facilities! Pine Harbour Bay - Really nice spot when you have westerlies. Drive into the marina and turn left, you’ll get to a parking place right next to the water. With low tide you’ll have to walk far out into the water, but with high tide this spot is very spacious and flat! Raglan - Known for its clean waves, this is a surfing mekka. However, when the westerlies turn up this spot usually gets some strong winds and is great for a weekend trip. This spot can give you some wave action at the Ngarunui Beach, but there is also a flat water spot in the channel closer to Raglan. Here the wind tends to funnel and gain in strength. Additionally, with outgoing tide the water movement will add a virtual few knots as well, so this spot can feel deceptively windy. Orewa - This is my favorite spot for easterlies. 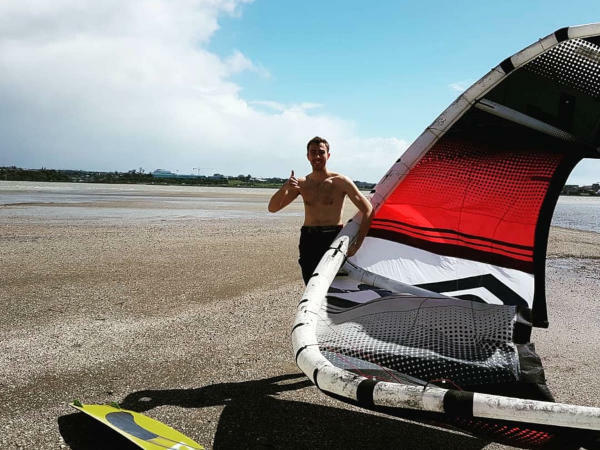 It is less than an hour north of Auckland and is a well-known spot for most kiters here. The small waves are great to use as a kicker. Takapuna Beach - I haven’t tried this spot myself as I usually go to Orewa, but with easterlies this should be a fairly nice spot as well. As New-Zealand is close to the antarctics, water is cool all year round and a 3mm wetsuit is preferable even in summer. In the winter you’ll need 5mm+ and boots/gloves. Be aware that the sun is VERY strong in New-Zealand. Use a sunblocker or put on sunscreen every hour. Since the sun is so strong, the sea breezes always turn out stronger than the forecast so that a 12 knots forecast can become an 18 knots day easily! Keep that in mind when the sky is all blue.